Henry David Thoreau Simplicity is the ultimate sophistication. Anonymous Seek simplicity and distrust it. We are overwhelmed by information, not because there is too much, but because we haven't learned how to tame it. Information lies stagnant in rapidly expanding pools as our ability to collect and warehouse it increases, but our ability to make sense of and communicate it remains inert, largely without notice. Perceptual Edge is an archive of the work of Stephen Few from 2003 through 2017 to help people make sense of and communicate data more effectively by representing it visually. 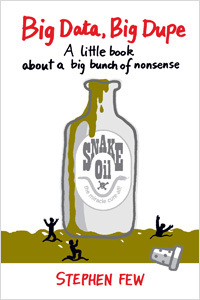 Stephen's new book, titled Big Data, Big Dupe: A little book about a big bunch of nonsense, is now available.